Do a quick web search under ‘biodiesel’ or talk to biodiesel enthusiasts and you could assume that DIY making of biodiesel is cheap and easy; that it’s environmentally sound; and that all diesel engine cars run beautifully on the fuel. But dig further and you’ll also find that the home production of biodiesel is potentially very dangerous; that to do it safely can involve costs much higher than they first appear; and that there are major question marks over car manufacturer support for biodiesel fuelled cars. And then there’s another (Australian) implication: all biodiesel (including DIY stuff) is taxed at 38 cents per litre. If the fuel reaches the required quality standard, you can get that money back from the government – but few if any home producers have their fuel quality tested, an expensive process. Instead, they just produce biodiesel on the quiet – modern day bootleggers waiting for the tax man to knock on the door! So what actually is biodiesel? Biodiesel is a fuel made by chemically altering vegetable oils or animal fats. Vegetable and animal fats and oils are triglycerides, containing glycerine. The biodiesel process turns the oils and fats into esters, separating out the glycerine. The glycerine sinks to the bottom and the biodiesel floats to the top and can be syphoned off. The process is called transesterification, a method that substitutes alcohol for the glycerine in a chemical reaction, using a catalyst. The alcohol that is usually used is methanol and the catalyst is either potassium hydroxide (KOH) or sodium hydroxide (caustic soda, NaOH). 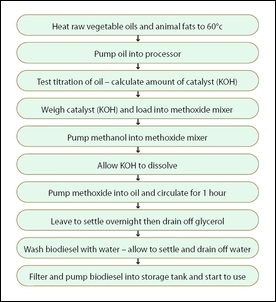 Biodiesel can be made in small or large batches: the smaller the batch, the more easily obtainable the equipment needed. journeytoforever.org describes the making of a small test batch of biodiesel. 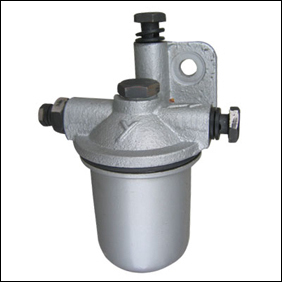 Accurately weigh out the catalyst – the amounts needed depend on its purity and also the characteristics of the oil. In this small batch only 3-4 grams are needed. Add the catalyst and then swirl the container until the catalyst dissolves. The mixture will grow hot from the reaction that is forming sodium methoxide or potassium methoxide (depending on the catalyst used). If the biodiesel is of appropriate quality, it should separate from the water in about 30 minutes. 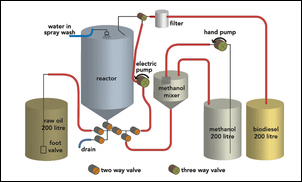 The biodiesel production process is then finished. Clearly the above description is not suitable for making large amounts. However it shows the type of process that needs to be followed, irrespective of the quantity being produced. To make useable quantities of biodiesel, more sophisticated equipment than that described above is needed. 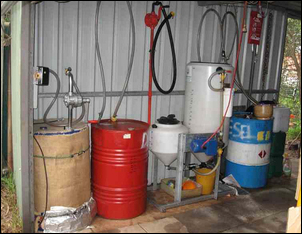 One example of a suitable home unit is the Biomaster biodiesel processor from Australian company Bioworks. It can produce 150 litres of biodiesel per 24 hour period. The Biomaster reduces emissions of methanol and does not require manual mixing of the methoxide. The base Biomaster costs AUD$3245. One person using a Biomaster is Jonathon Thwaites, who also runs seminars on home biodiesel production. 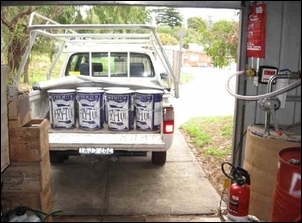 His biodiesel plant is located in a backyard shed, has full local government planning permission and conforms to legislation relating to storage of dangerous chemicals and fuels. For every 100 litres of biodiesel that is produced, you’ll need about 100 litres of used vegetable oil (or new oil of course), 20 litres of methanol, water and a small quantity of a catalyst. So, to perhaps state the obvious, if your car uses a tank of fuel a week, to run it entirely on biodiesel you’ll need to collect something like 50 litres of oil a week! In addition, you need storage facilities for the used oil, the methanol and the biodiesel. These vessels must be safe for fuel storage (no bodgy plastic containers!) and must be located in an area approved for the storage of the quantities you’re dealing with. The glycerol will also need to be disposed of – it’s biodegradable and water-soluble so disposal doesn’t normally cause too much of a problem. Take into account the sourcing and collection of the raw oil, the storage of the chemicals and liquids, the requirement (in our view it’s a requirement!) that quality and safe professional equipment is used, and you can see that making your own biodiesel is a pretty major on-going exercise. Biodiesel is often blended with petroleum diesel fuel. The ratio of biodiesel to petroleum diesel is expressed as ‘B’ number – B100 is straight biodiesel, B5 is only 5 per cent biodiesel, and so on. Biodiesel and petroleum diesel blend seamlessly. So having produced your first batch of biodiesel, can you just pour it into your diesel car’s tank and head off? Well, yes and no. Firstly, it’s unlikely – very unlikely – that your car’s manufacturer’s warranty will be valid if you use untested fuel in your vehicle. Secondly, even if the fuel can be shown to be of high quality, the manufacturer may well not permit B100 use. When using biodiesel, fuel filters will initially need to be changed frequently – biodiesel acts as a fuel system cleaner and so more material will be deposited in the filter(s). Some suggest that the engine’s fuel injection timing should be retarded for better results (and lower oxides of nitrogen emissions – see below), a process that on diesels of the last decade will require engine management modifications and on earlier engines, skilled mechanical adjustment. Despite anecdotal evidence of how diesels ‘love’ to run on biodiesel, the only dyno tests that we have been able to find show a decrease in power or, at best, a matching of the power achieved on petroleum diesel fuel. This isn’t to say that if the engine was tuned specifically for biodiesel (eg on electronically managed cars by the use of an aftermarket interceptor), the results wouldn’t be better – the cetane value of biodiesel is higher than petroleum diesel. Finally, the emissions performance of biodiesel is a question mark. Some studies show on biodiesel increased emissions of hydrocarbons and oxides of nitrogen, but reduced emissions of particulates and carbon monoxide. However, how good the emissions are of a modern biodiesel-fuelled car (complete with exhaust particulate filters, a cat converter, perhaps urea injection – all designed for petroleum diesel) is not so readily discernible. 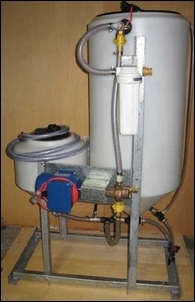 It initially seems a great idea – brewing your own fuel in your backyard shed from vege cooking oil that’s being thrown away. And for people in certain circumstances, we think individuals producing biodiesel is a great idea. For example, we talked to a truck operator who is making 14,000 litres of biodiesel a week. His trucks pick up the waste oil (though it now costs him $800 a tonne; four years ago it was free) and he then turns it into fuel for his truck fleet. His biodiesel plant operates 24 hours a day, 7 days a week. We can also see it working very well on a farm. But those situations are very different to a suburban home producer. To be honest, the thought of people handling relatively large quantities of highly inflammable fuels and toxic chemicals - and doing so in backyard sheds - seems to us to be a series of disasters in the making. With suitable equipment, and appropriate fuel handling facilities and safety equipment and procedures, the risk can be brought down to manageable proportions – but then again, the capital investment is also much higher. But that’s definitely not to say that biodiesel itself isn’t worthy of much greater attention and use – but produced commercially or semi-commercially to the required quality standards.